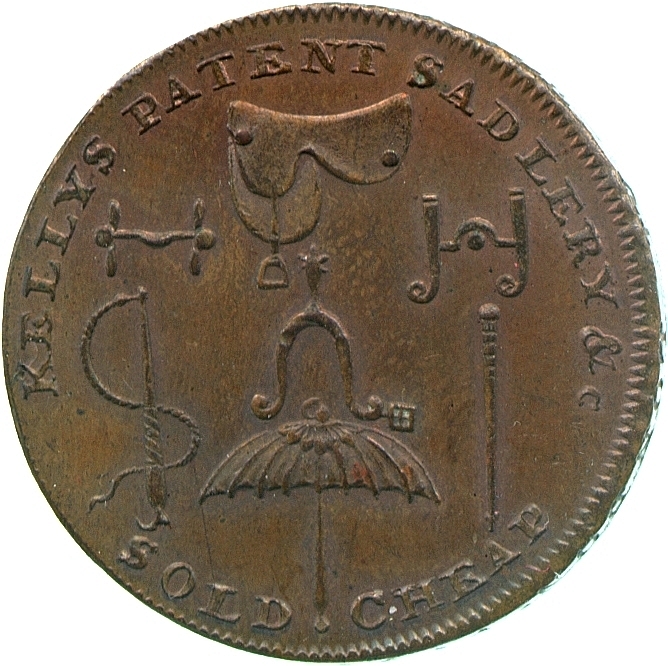 At various points in British history the supply of official money issued by the state has become sufficiently scant that unofficial coinage has entered circulation. 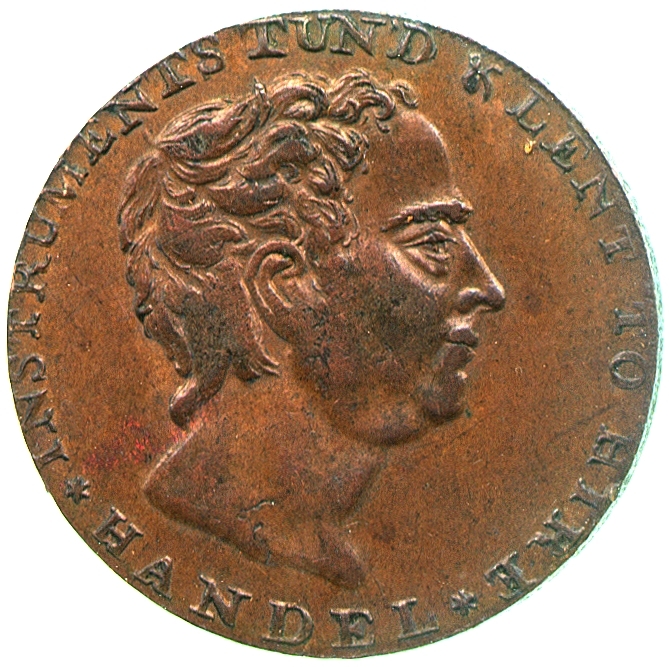 This has applied especially to small-value coins, in whose manufacture there is little profit for the state and which the government does not need for its own expenditure. For the common working man, however, the absence of lesser denominations made simple transactions very difficult. 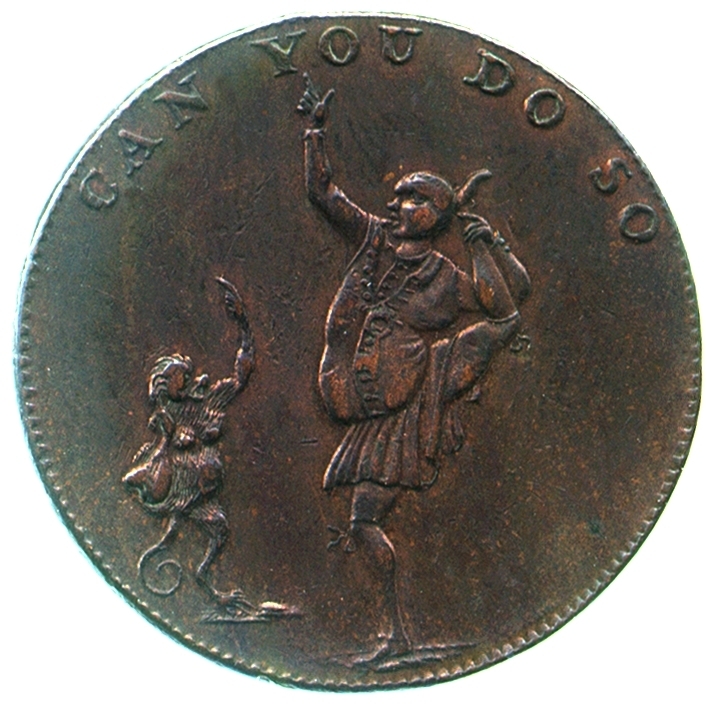 For example, if he was paid fifteen silver shillings a week, but wished to buy bread worth three halfpence, his coins were each worth much more, and the shopkeeper would not easily be able to refund the difference as change. 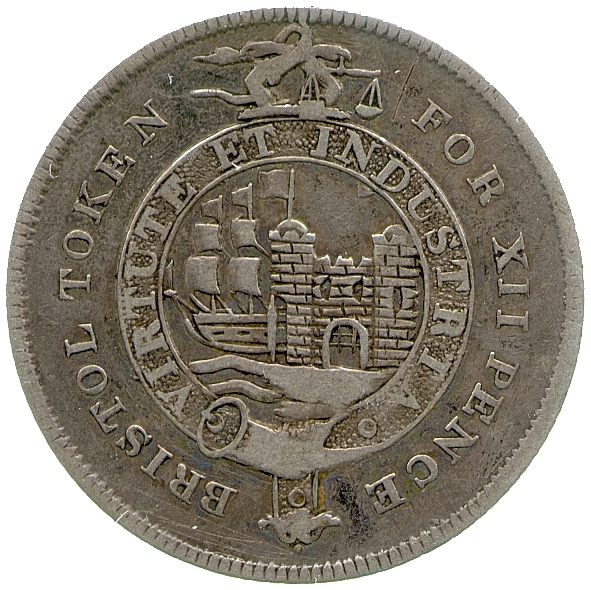 Particular periods of such change shortage were the years around the English Civil War and the French Revolutionary and Napoleonic Wars, and both generated a substantial 'token' coinage of lesser denominations to supply the want, which are now highly collectable and of great historical interest. 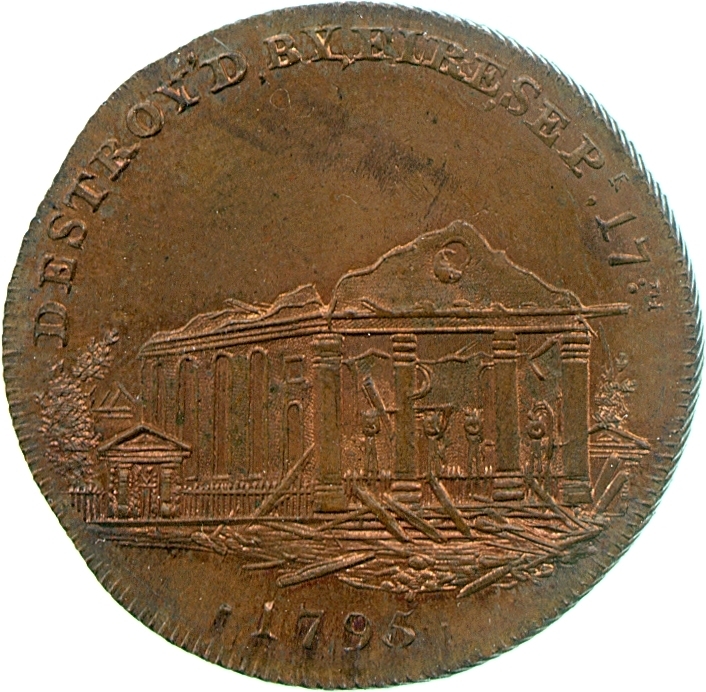 The main difference between the tokens of the eighteenth century and those of earlier periods was that for the first time, due to the developing copper industry making the metal available in greater quantities and more cheaply than ever before, and due to new techniques employed, for instance, by the famous Soho mint of Matthew Boulton, it was possible for such pieces to be cheaply made in large numbers by machine. 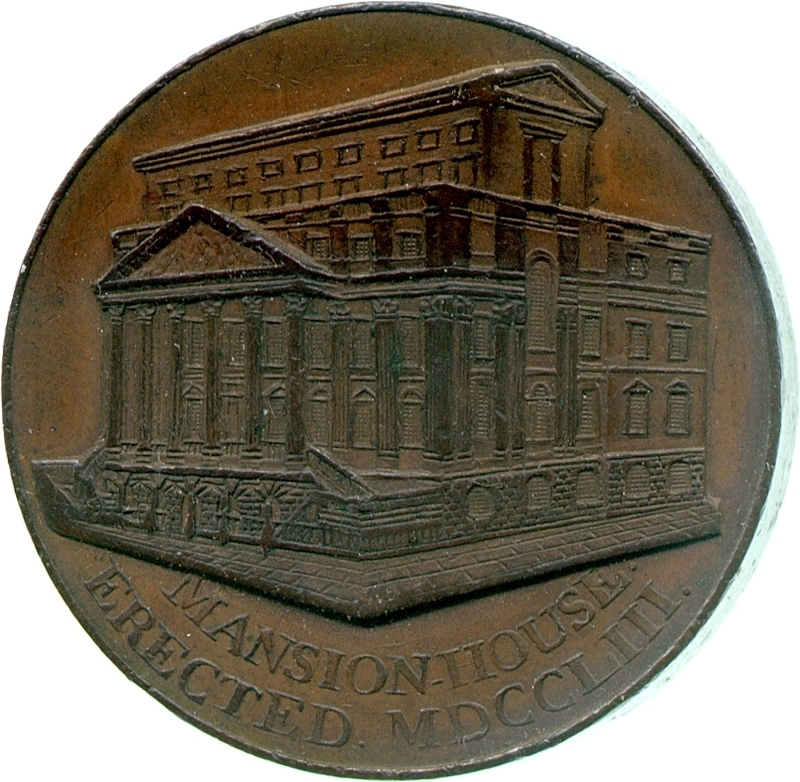 At the same time, there was a number of extremely talented engravers who could be hired, through the mints, by those who wished to issue such tokens and their artistry accurately reproduced token for token until their dies wore out. 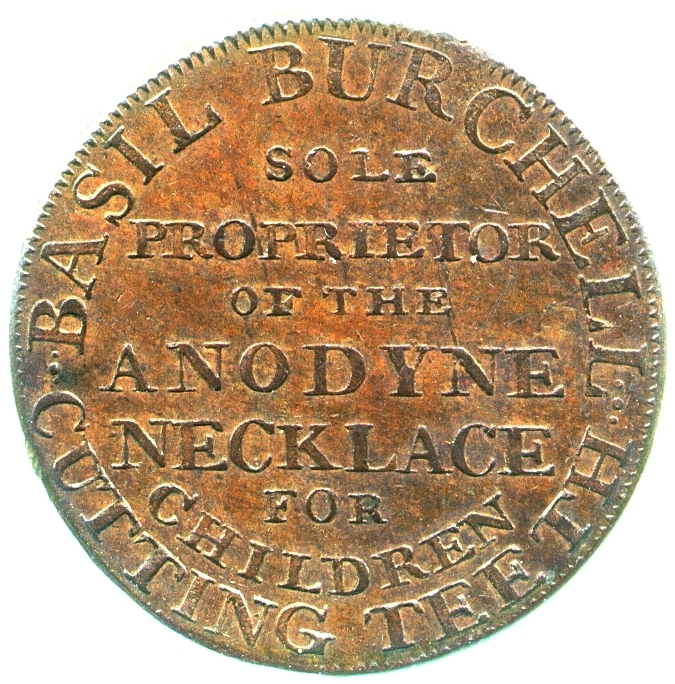 (Many of the more numerous issues went through dozens of dies, providing regular work for the engravers.) 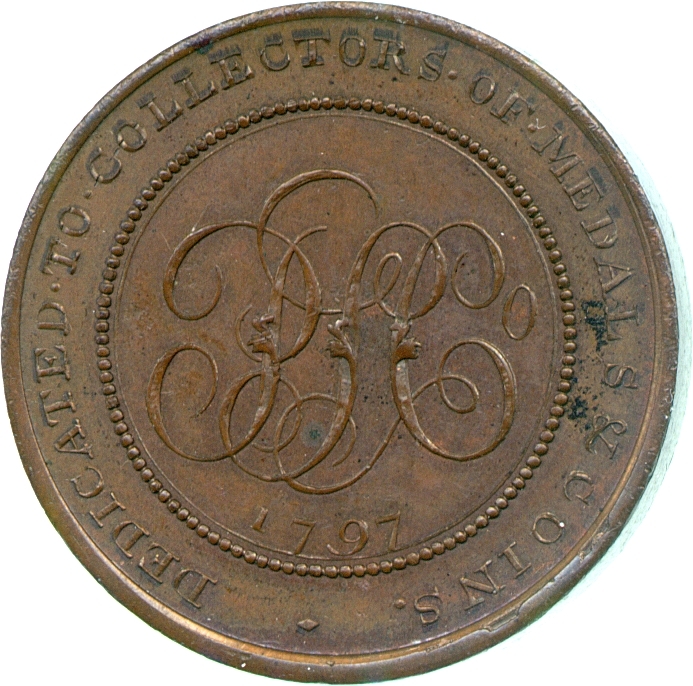 The period therefore saw the wide circulation of numerous pieces which qualified as genuine works of art, and the number of collectors of these tokens proved to be so great that, although large-scale currency issues mostly ceased after 1792, large numbers of low mintage issues continued to be made solely for such enthusiasts, with no intent of being used as commercial coin. 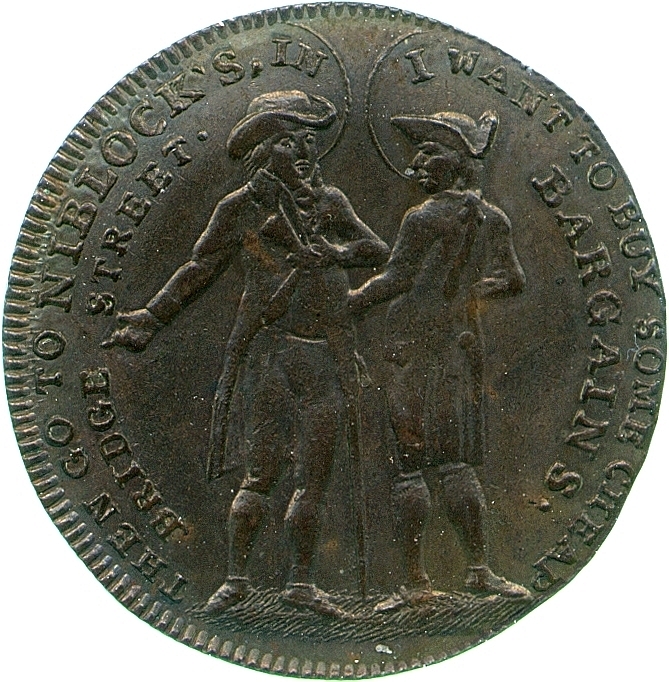 Obverse of a copper halfpenny token issued by Niblock of Bristol, 1795; the speech-bubbles read, "I want to buy some cheap bargains·" and "Then go to Niblock's, Bridge Street·". Spencer George Perceval Bequest, CM.4.446-1922 (double size image). 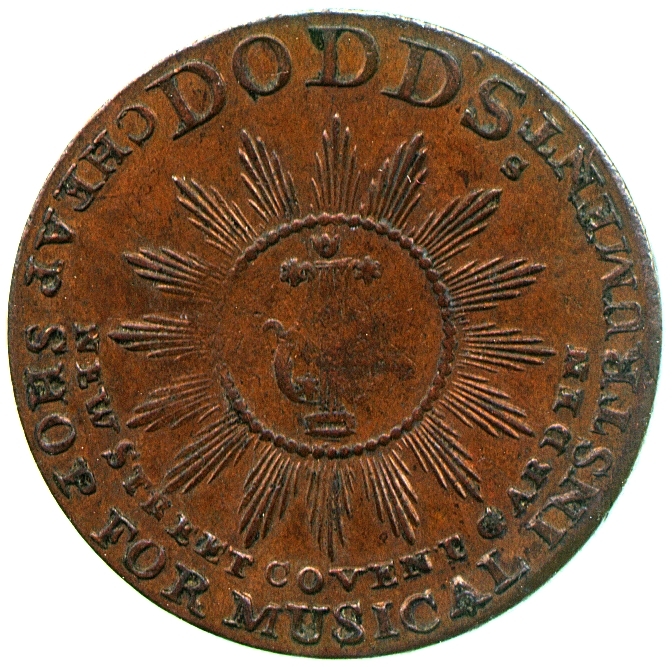 Ready adopters of the vivid depictions that could be passed into people's pockets by token advertising were the owners of theatres and circuses. 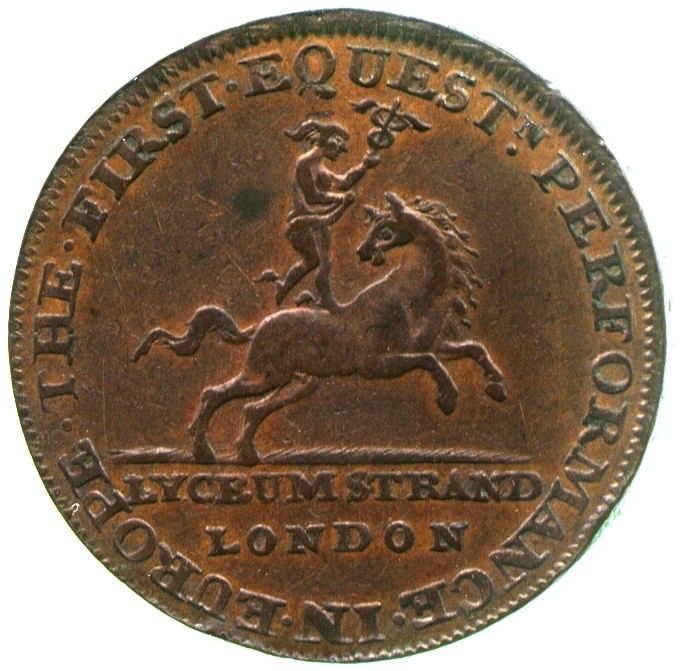 The largest series of issues was perhaps that issued by Gilbert Pidcock, proprietor of Pidcock's Menagerie on the Strand (a difficult thing to imagine now!). 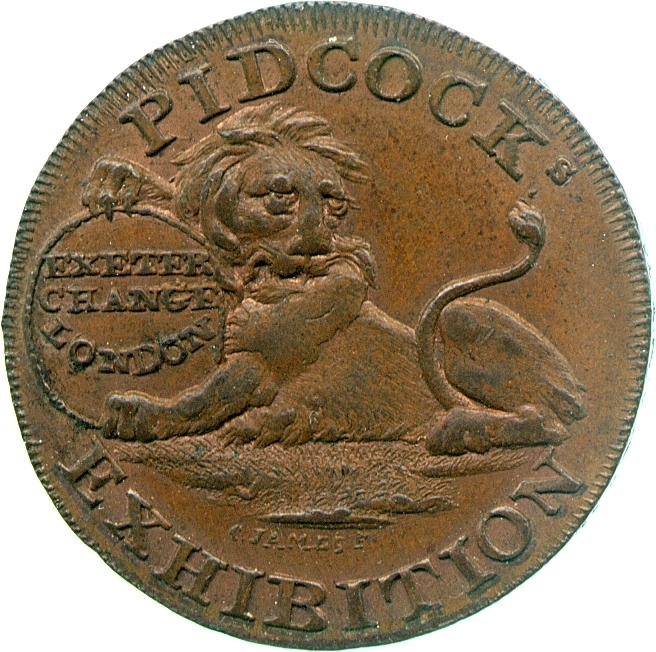 Pidcock's were not the only tokens advertising such entertainment. 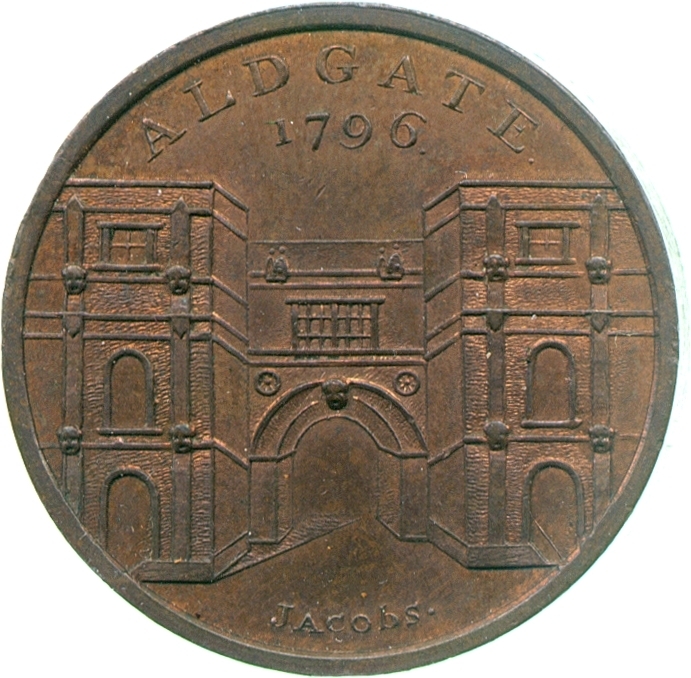 Particularly in London, where the market was largest because of the density of population, tokens were sold as goods themselves, pieces of artistic or even historical interest for the number of collectors that had grown up around these unofficial monies. Sometimes this intent was explicitly declared. ... and some of which were already past when depicted!